While vehicle to person collisions are most likely to occur on a site where vehicles and pedestrians work in close proximity, collisions between two vehicles may also occur on large scale worksites where different vehicles movements and types are operating in close proximity of each other. Quarries and open cast mines are good examples of where these types of collisions may occur. The vehicle Detection System helps to reduce the risk of collisions between industrial vehicles by providing a long-range detection zone of up to 60 metres to alert drivers of up to 15 oncoming vehicles at any one time. The detections can then be recorded and analysed using ZoneSafe software to help identify risk spots and improve traffic management. The vehicle Detection System differs from other ZoneSafe systems as it requires line of sight between vehicles. A ZoneSafe Antenna is fitted to the roof of smaller vehicles and provides a 360 line of sight zone for up to 60 metres. 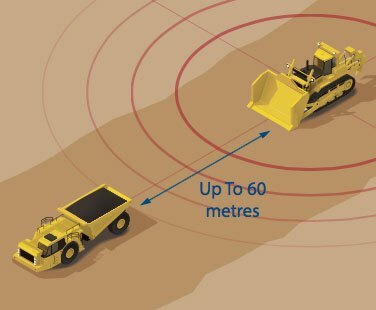 For larger vehicles, the vehicle requires multiple ZoneSafe antennas to cover all sides of the vehicles and create a 360 line of sight for up to 60 metres.